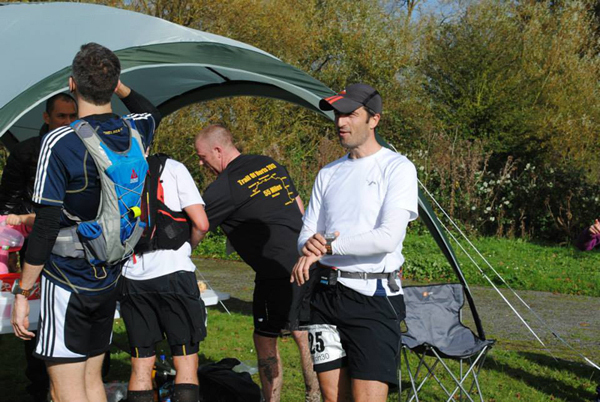 The Stort 30 is a 15 mile out and back run along the River Stort in Hertfordshire and is organised by Lindley Chambers of Challenge Running. I had entered the event as an end of season run and it was a good chance for me to catch up with some friends. 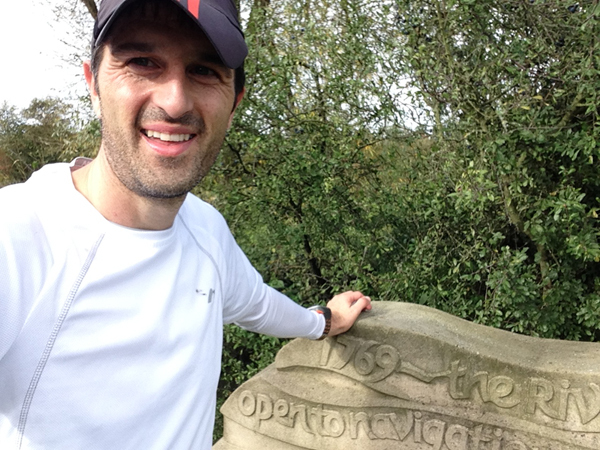 I should also admit that I was also attracted by the very unusual medal design, which is a replica of a stone marker about 10 miles into the route. I quite like collecting unusual (or just plain old large) medals er… for the shoebox I keep at the back of a cupboard. Prior to the event I caught up with Lindley & Sue (who was running the event) and met Alistair Stewart from The British Trail Running Podcast for the first time, Alistair was on sweep running duties with Jerry Smallwood and we indicated he probably wouldn’t lack for conversation en route the next. This is the second running of the event which starts and finishes at Bishops Stortford Club House and starts at 9am with a 7 hour cut off. There are checkpoints at the 5 and 10 mile point, another one at the turnaround point at 15 miles and then the first two checkpoints double up as the 20 and 25 mile checkpoints on the way back. A detailed route description was provided but some temporary route markings (blue arrows) were laid out on the course the day before and navigation was pretty straightforward and I didn’t have to look at the written instructions once. The route is largely grassland, trails and graded footpath with the first (and last) half a mile on pavements to the start/finish point. I caught up with a few other runners and supporters before the start of the race (hello to Sam, Richard, Naomi, Nick, Karen and a few others) and we readied ourselves for the 9am start. The weather had been very wet earlier in the morning which meant ground conditions would be muddy for a few miles but the weather itself at the start was fairly cool and pleasant and I elected to run in a base layer and top and leave the rain jacket behind. Following the race briefing, the race started promptly with two laps of the sports field. Immediately, a group of about 10 runners formed a lead group and I settled towards the back of a second group of another 10 runners as we made our way around the field and then followed the road down to the canal path. After last weeks Caesars blog on motivation, I thought I had better make a bit more of an effort today. The first few miles of the race were muddy and wet. I had elected to wear my Salamon Sense Mantra which gave me reasonable grip but I still slid around some of the muddy areas a few times. (As a side note, I’m still searching for my “go to” trail shoe as I found the Sense Mantra’s too firm for my liking and am leaning towards the cushioning of the Scott Kinbalaua at the moment but other recommendations/suggestions welcome). The pace for the first few miles was a shade under 8m/m with a steady which wasn’t too bad on muddy ground. I had elected to use the Jurek Endurance belt with two small bottles which meant I didn’t stop at the first aid station and carried on through sneaking up a few places only to find myself dropping all of these and more as I had to stop for a short comfort break. After the first aid station the ground conditions became more favourable with more pathways as the route crossed a couple of roads and bridges. The route also became a little wider here aswell meaning it was a little easier to overtake if you wanted to. I continued on at the same pace following the same group of people ahead. I didn’t stop at checkpoint 2 and carried on towards the halfway turn point. About a mile before the turn-point I saw the two leaders (Craig and Richard) heading towards me on the way back at some pace. I crossed the bridge following the blue marked arrows and headed towards the mid-way turn point. As I got nearer to the checkpoint, runners were starting to come the other way as the lead group of runners had turned and were heading back and I passed Sam Robson who was already coming the other way. I arrived at the turn-point bang on two hours, grabbed a few snacks, had a couple of drinks and started walking back eating the food I had grabbed on the way. Race Director Lindley shouted “I thought this was just a training run?” in a questioning manner. I had given the “out” leg a bit of effort but had planned to ease up on the way back as my legs were feeling it a bit after Caesars last week and the stiffness of the Sense Mantra’s meant my feet were actually feeling pretty sore. At that point, I felt as if had made enough of an effort and was thinking about a much easier 10m/m pace on the way back. As soon I mentally eased off everything felt a little better, I was now passing people coming the other way and giving them a bit of encouragement as others had done for me. I high-fived a few people I knew and I trotted on at a slower pace. I switched the Garmin to map mode to take away some pressure of looking at the time and pace and carried on at a steady but easier pace than the out leg. I even stopped a few times to grab a couple of pictures on the way back. I was just enjoying the running for those few miles without a care in the world. 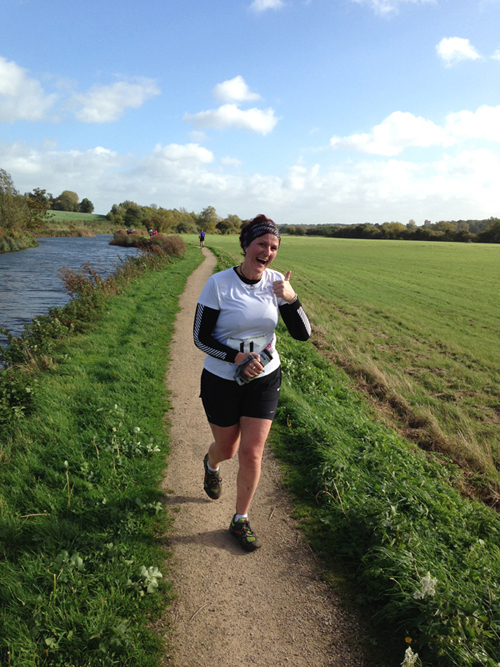 After a few miles on the way back I had passed a few friends including Nici Griffin who was doing her first ultra and snapped a quick picture of her and then saw Jerry and Alistair who were on sweeping duties. The weather was still quite nice and I was still running quite steadily and the miles passed reasonably quickly. 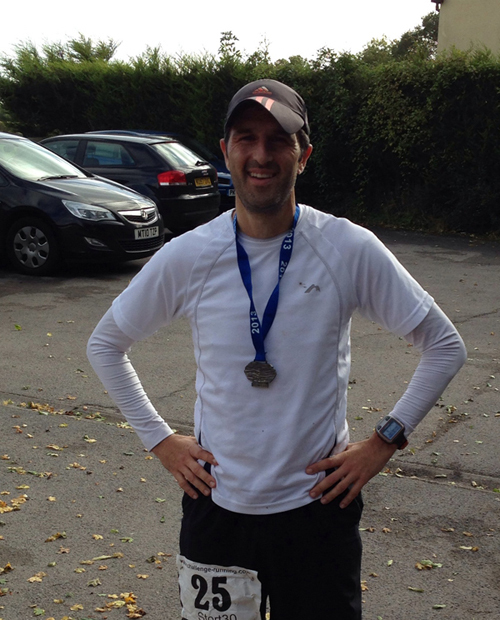 The 18 – 24 mile section was a bit of a slog to be honest. My legs were still feeling like they were at the 25 mile point of a marathon and it wasn’t quite close enough to the finish to think I was nearly there. It was simply a case of getting your head down and plodding on, I spoke to a couple of people who were near me but didn’t have a lot of company as the group around me had got ahead when I paused briefly for a quick picture of the stone marker which the medal is designed after. As I got closer towards the final checkpoint, I started to reel a few people in. This was more down to the fact that they had slowed slightly rather than any extra effort myself as my pace was fairly consistent. I caught up with Sam Robson who was still suffering the affects of his recent illness and had slowed on the return leg and passed a couple of other people aswell. I arrived at the final checkpoint had a few cups of coke and then set off for the final leg. I spotted a few people ahead of me which did act as a little motivator to keep me running and I managed to pick off a few more runners ahead whilst one chap who had been running with the lead lady came flying past me with a few miles to go. Thankfully, the earlier muddy sections appeared to have dried out quick quickly as I had been expecting this section to be worse on the way back after the attention of 140 or so runners but it wasn’t too bad at all. I followed the trail until it came off the river and onto the road and followed the round to the roundabout where you took a right hand turn towards the start. I must admit to having a look behind me and after not seeing any other runners taking a 30 second walk and stretched out the legs before head down and plodding in the last half a mile or so to the end. I followed the road towards the left hand turn and plodded up the short section of road to the club. 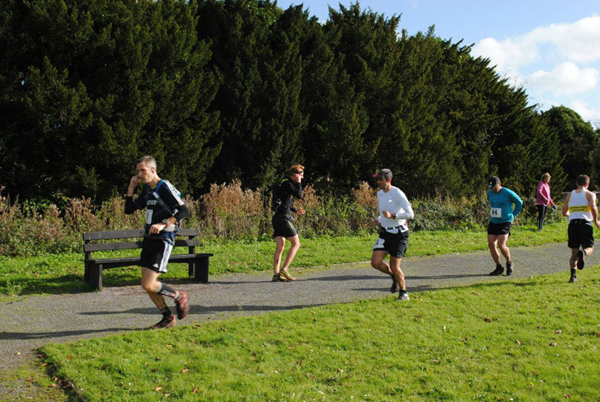 I did see a couple of runners ahead but they were a little too far ahead for me to try and catch and I kept a watchful eye behind me to make sure no-one was going to sprint past me! The final part of the race involves a lap around the field in reverse and I jogged around to finish in 4hrs 11mins in 13th position overall which I was quite satisfied with a week after Caesars. 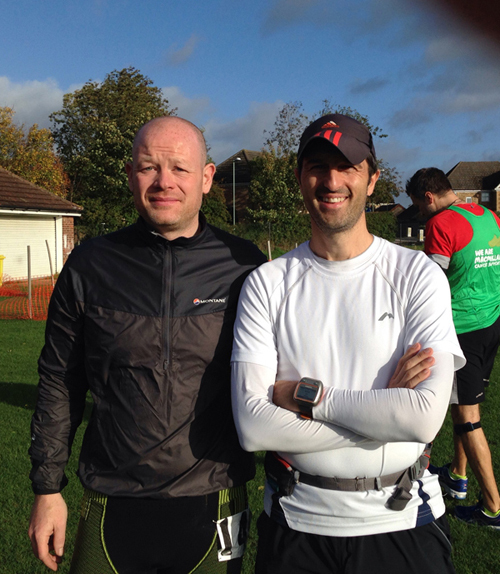 Thanks to Lindley and volunteers for a well organised and enjoyable run. The weather held off for me but it did pour down an hour or so later so a few runners may have got caught in the rain. Lindley gave me a T-Shirt and the fabulously designed medal and I took advantage of the changing and shower facilities at the Club House before grabbing something to eat and heading back home. 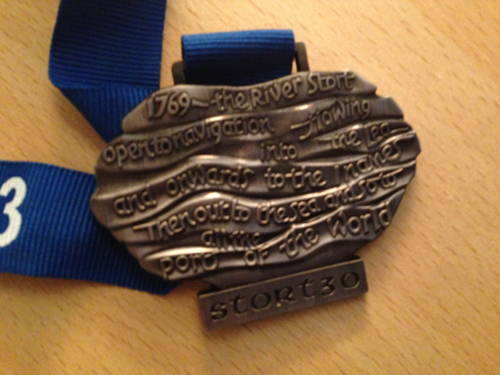 The Stort 30 is a good friendly event, a pleasant run, represents good value for money at £25 for the run, unusual medal design, technical t-shirt, race support including free tea, coffee drinks before and after the event. 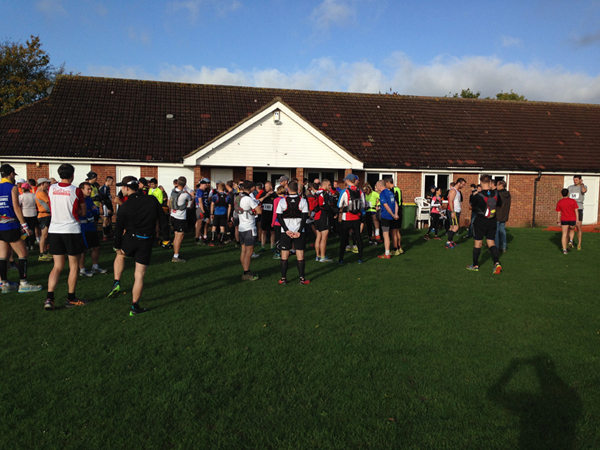 It was a well organised run and an enjoyable day overall.